ML: What are the basic building blocks of a good flute technique? JS: I think there's a lot of room for possibility in that question. As far as developing finger technique goes, it's best to work slowly and steadily over a long period of time. I know, for example, that my technique is still getting better, and that there are things that I can do easily now that I couldn't do when I was your age. Physical growth comes from exercising muscles and becoming aware of how you're using them. Part of that is psychological, becoming conscious of how you use your body; that leads to the part that is physiological. Your muscles have to grow up and get the message that you're building them by practicing. That said, it's important to have a stable practice routine. Scales and arpeggios are great for this, especially because they build an awareness of key areas. I'm going on a tangent away from your question, I know, but key areas are the root of what makes sound, or what makes music interesting; that's the language we speak-- in varying different keys. Using scales as a way not only to develop your fingers but also to be aware of color (that one key sounds different from another) makes practicing technique interesting. ML: Other than slow practice, which hopefully everyone does, what do you do when you get a passage that you're just stuck on? JS: A lot of the ways I fix problems are practice games that I made up when I was in high school and college. And since they worked, they became parts of my technical routine. Slow, steady practice is great. The metronome helps by building a sense of pulse in everything that you do. Pulse runs music, so you can't let go of that. But the best reason to use a metronome for improving a technical passage is that it provides a goal: you know what tempo you need to reach, and you back off of that, building confidence and finger ability by degree. Backing off and working slowly is also important because, when you get stuck with a problem, usually the reason lies in some sort of physical tension that you need to understand to get rid of. If you quickly just go over and over the problem spot, you're forcing your hands to do something that isn't working, and you're creating tension at the same time that you're reinforcing a bad habit. When you back off, you allow your mind time to process what is wrong, and to figure out how to fix it. Asking, "am I hearing every note cleanly, the way I want to?" is a way to build consciousness about what's happening. While we're talking about slow practice, here's an example of a practice game for a tricky passage. Try a chain of beats, let's say A, B, and C, stopping at the downbeat of D. Work that out, then do B, C, and D, stopping at the downbeat of E. Then C, D, E, stopping at F, and so on. So you're working out segments, but always bridging the connection from one to the next. This is a very effective technique, and one I would do at any tempo, but certainly the best is gradually building it from a slow tempo towards your ultimate goal. Doing the same thing in reverse, starting at the end of a passage and going backwards (the last beat, the last two beats, the last three beats, until you've started at the beginning and played through it) also tends to be really effective. But always start with a question that forces you to listen and focus: "What note am I not hearing? Why? What do I need to do to fix that?" And then you're on your way. 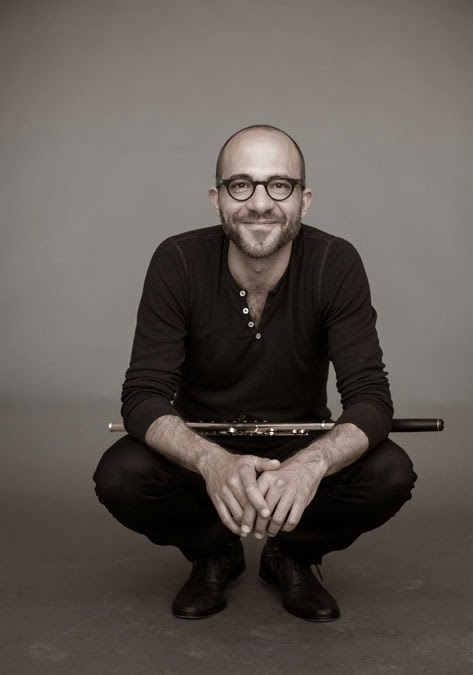 Visit Joshua Smith's website at www.soloflute.com and follow this link to his artist profile page on the Powell website.